Opatz Metals and Rolloffs offers a disposal drop-off site for your oil, antifreeze and oil filters conveniently behind Opatz Metals scrapyard. There is a nominal fee for oil filter drop off. 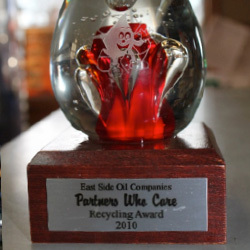 Opatz Metals and Rolloffs also plays an active role in recycling, we were awarded the Partners Who Care Recycling Award 2010 by East Side Oil Companies. Opatz Metals, Inc. takes its concern for the environment very seriously. That’s why the state of Minnesota has issued an EPA storm water runoff permit to our facility. 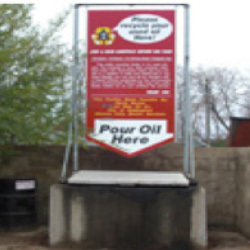 Opatz Metals, Inc. also has an East Side Oil dump off right behind our facility for your convenience. That site accepts used oil, used oil filters, etc. for a minimal fee.